Suzhou. 100 kilometers east of Shanghai, is situated by the Taihu Lake in the fertile Yangtze River Delta. It is a famous cultural city with a venerated history of more than 2,500 years. Simultaneous with the emergence of Suzhou as a city was its water-bound layout in which rivers and streets run parallel to each other, and residences were built along running streams with tiny bridges sitting astride them. 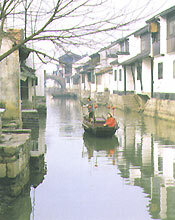 Suzhou is known in particular for its classical gardens. Suzhou gardens are most glistening gems among China's tourist attractions. The construction of gardens in Suzhou dates back to the East Jin Dynasty and the Five Dynasties period, which took place along with the building of city walls and palaces and dwellings, so much so that garden construction became something of a fashion during the Northern Song Dynasty. By the Ming and Qing dynasties, the feudal economy and culture reached a period of prosperity, and the art of garden construction achieved maturity. A contingent of garden artists and builders emerged, propelling garden construction to a climax, and the number of private gardens and courtyards topped 270. No other Chinese city had as many private gardens as Suzhou. Suzhou's Humble Administrator's Garden and Garden to Linger In are among China's four best-known gardens along with the Mountain Summer Resort of Chengde and the Summer Palace of Beijing. The gardens existing to this day in Suzhou were mostly owned by individuals obsessed with a tranquil and nature-friendly environment. Within a limited space, the low-lying place was converted into a pond, around which trees and flowers were planted, and artificial hills were built along with pavilions and chambers, thereby forming a graceful living environment that was full of poetic feelings. To be "immersed in the peaceful repose of a mountain forest without going outdoors, forget about the traffic and den of the city, and get lost in the tranquility of the woods and gurgling springs" -- this is precisely what was on the owners' mind when they built gardens in Suzhou. As befitting the Chinese style of garden culture, a limited space is ingeniously grouped into a kaleidoscopic scenery that is evocative of the conception and techniques of traditional Chinese landscape painting. A garden is thus called a three-dimensional Chinese landscape painting. The picturesque Suzhou gardens are precious gems in China's national culture and the culture of the Orient as a whole. In December1997, four Suzhou gardens, the Humble Administrator's Garden, the Garden to Linger In, the Garden of the Master of Fishing nets and the Huanxiu (Circular Elegance) Mountain Villa, appeared on a UNESCO list of world cultural heritages.